Analyzing the above plans in the order they are in, My Local plan which comes for Rs.299 per month gives a very good value for money. It is similar to the GSM operators full value plans, but is better in the way that it offers (300 mins.) free calling to other networks also. The call rates thereafter are also quite good. Next, we take My STD, which is good but not as great as the first one. This one just provides Rs.375 worth of local and STD calls to all networks. For those of you worried about Roaming charges, My Roam is made for you. 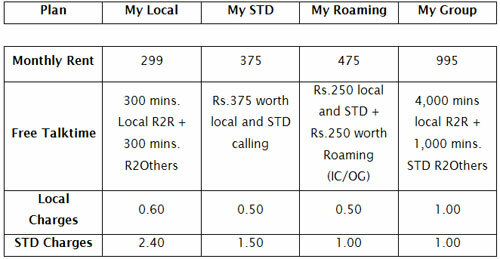 This one provides you with Rs.250 of local and STD calls free and also Rs.250 worth of roaming free. The call charges have been lowered with local and STD being charged at 50 paise and Re. 1 respectively. Last but not the least is the My Group Plan, which is for the biggies. This one is The 1. It provides you with a whopping 4,000 minutes of Reliance to Reliance local calls and 1,000 minutes of Reliance to Reliance STD calls. Other local and STD calls are charged at Re. 1. The plans are great and cater to the varied user segments giving each user a different scheme to choose from.